The New Orleans Burlesque Festival is thrilled to have Jo Weldon return to the festival this year. Jo is the headmistress and founder of the New York School of Burlesque. Her new book, The Burlesque Handbook, was released this summer by HarperCollins. It is the essential manual to understanding and performing both classic and neo-burlesque. NOBF founder/producer Rick Delaup asked Jo twelve questions that were on his mind. from beginners who have read the book? Since the book was based on handouts and information given in classes, which produced students who went on to become successful performers, I knew it would be a useful guide. I've gotten great feedback from new performers. Most often, they comment that it has changed the way they thought about some of the details I discuss, such as music and color choice. And almost all of them have commented that they appreciate the chapter on etiquette. In fact, a lot of experienced performers have told me they appreciate that chapter! 2. What are some of the qualities a successful burlesque entertainer should have, that can’t be learned from a book? 3. I’ve come across women who want to perform in burlesque shows, but don’t want to strip down to pasties or a g-string. Is there room for them in burlesque? I have to teach on TV fairly often, and I'm able to convey some of the movement and style of burlesque without going that far. However, I think pasties and g-strings are what ultimately make burlesque so remarkable. It's the only performing art in the world in which striptease plays a part. Why leave out the think that makes it unique? The other elements--sexiness, satire, etc.--are all available elsewhere. 4. Burlesque performances are known for iconic props like feather fans and boas. What small props have you seen over the years that are unique, but just as effective? In my opinion, every costume piece should be used with the same attention, care, and theatricality as a prop! I'd love to see more folks really get into working the robes. When I began working in strip joints there were a few people who were still working robes and chiffon, and they had a sort of casual showmanship that was mindboggling. They made the most elegant sculptural forms, and framed and revealed their bodies in the most devastating ways. 5. What kinds of things does a burlesque performer learn from years of stage experience? You learn to what the audience responds, instead of just what looks good in the mirror during rehearsal. 6. There are some burlesque performers who don’t, or rarely, attend burlesque festivals. Being that there is a sense of community in the world of burlesque, what are the advantages of attending a burlesque festival? Just that, the sense of community. It is a very special world! And the opportunity to network with that international community is stronger in person than online. 7. I know a lot of dedicated dancers dream of making a comfortable living in burlesque. These days, it’s an extremely difficult thing to do. What advice can you give a dancer who would like to earn the same income as Dita Von Teese? Nobody earns the same income as Dita, and I can't think how anyone could plan to do so. She is a celebrity, and celebrity is hard, if not impossible, to deliberately create. Anybody who wants it has to be prepared for it. She is an entrepreneur and a person who has branded herself and has built powerful collaborations with people such as her costumer Catherine D’Lish, her manager, her web person, and others with whom she has worked or did work for many years. She had an image and stayed true to it; there's a lot to be said for believing in what you love to do! But there isn't a beaten path to being a burlesque celebrity, in the same way there is a path to try to prepare for a million-dollar record contract. There just isn't a burlesque industry in the same way there is a record or movie industry. We all have multiple streams of revenue, and certainly Dita does. Or, we have to get jobs and do burlesque on the side. And also note, young performers -- Dita responds to all her emails with her best possible grammar and no texting shorthand! She's always professional. 8. With so many burlesque performers out there these days, what’s the best way for a dancer to get noticed and recognized? 9.You are one of the organizers of BurlyCon coming up in October in Seattle. What can attendees expect this year? BurlyCon is an amazing experience, complete immersion in burlesque and all it can be. I love it, and I love participating as well as instructing the classes. It's the ultimate burlesque community experience because no one has the pressure of performing. Of course we love the pressure of performing, but it's really wonderful to just experience the people we know and love without the hustle of work. 10. While in New Orleans, what are some of the things on your itinerary outside of the burlesque festival activities? Not many! I can't wait to see my friends. I love the festival, and I want to take classes and see all the shows. But I look forward to taking the streetcar out to the Garden District for a leisurely walk. 11. We're all working to move the burlesque scene forward, make the art form more popular, and sell more tickets. What areas need the most improvement, and what can be done to get there? I think it needs to be kept playful, sensual, not too self-conscious. Over the past few years I've seen top performers repeatedly raising their own bars, and new performers developing much more rapidly than they used to. I love it! I think the marketing in some cases, especially smaller shows, could be aimed a little bit less at what burlesque connoisseurs think will be appealing, and more toward what the uninitiated might find appealing. Burlesque just is appealing! 12. What are your views on the mainstream media's coverage of burlesque? It's kind of amazing that they still keep claiming "Burlesque is Back!" But that's part of what I was talking about with regard to marketing. There are still plenty of people to whom burlesque is new. This is very true. At the 2nd Annual New Orleans Burlesque Festival, our audiences will be filled with many locals, as well as visitors to the city, who will be exposed to burlesque for the first time. It’s a wonderful event to catch so many great performers from around the world performing over one weekend. The Burlesque Handbook will be available for purchase throughout the festival weekend. 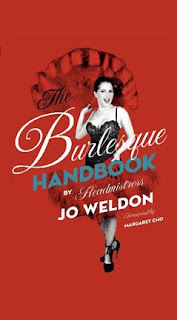 There will be many opportunities to meet burlesque star, instructor, and author Jo Weldon over the weekend. Jo performs Friday, September 17th in the Mondo Burlesque showcase at Harrah’s New Orleans. You can also find her at the shows, parties, panel discussions, as well as the afternoon burlesque workshops at the Westin Hotel. For more on the NOBF (Sept. 17-19), visit www.neworleansburlesquefest.com. Photographers Look Back at The 1st Annual New Orleans Burlesque Fest! We asked photographers from last year’s inaugural New Orleans Burlesque Festival to submit some of their favorite photos. Meet two of the photographers, and take a look at their favorite shots! Andreas Koch: "Being originally from Germany, I have always been fascinated by the beauty of the “All American Girl” and everything that is Cheesecake and Americana. Becoming a Photographer at a mid point in my life, I immediately was drawn towards the world of classic Pin-up photography and Burlesque performers. I find there is just something about the classic beauty of a woman photographed in a way of days gone by, that both fascinates and mesmerizes me." Photo of Trixie Little (above) by A. Koch. "I love everything about this shot from the composition, to the way the lights hit her just right. It feels both staged and natural at the same time and to me it’s perfect from her hat to her stilettos." "This shot is the perfect combination of sensuality, innocence and femininity. It’s a great example of what modern Burlesque is all about. The art of the tease." Jeff Teachworth: "I wasn't even sure whether I was going to be able to make it out to the Burlesque Fest that Friday night. I had other work to finish and wanted to stay in and catch up, but something kept telling me to just grab my camera and go. I hadn't known much about burlesque at that point, especially that this experience would change my life. So that Friday night I walked into the New Orleans Burlesque Fest with my camera in hand, I didn't realize I was about to strike photographic gold, I was just curious about what exactly burlesque was. After showing them my card and explaining my experience, the management was happy to have me and I walked into a very classy art-deco styled theater in Harrah's New Orleans casino. In fact, it looked more like I was at a Broadway show. Once the show started, I immediately knew I was in for a great experience. Photo of GiGi LaFemme (above) by Jeff Teachworth. As the performers came out, they were all shapes and sizes, all dressed beautifully in fancy historic glamorous attire, pulling it slowly off and modeling it all with the confidence and poise of trained dancers. I got a memory card full of exciting images that night. As I looked through them later, I saw gold, and when I showed them off, everyone loved them - both my male and female friends. In fact, one photo became a signature piece for me. It is of Mia Vixen, all dressed in red with starry black background and a hot white spotlight behind her. I present it here in its later form as an advertisement for my feature publication. Photo of Mia Vixen (above, right) by Jeff Teachworth. Not only did these and other photos inspire me to specialize in burlesque, but as I followed it locally, I built up a portfolio which inspired me to combine it with my journalism skills to create a magazine called, 'Burlesque Scene'. Now I routinely document the images and the words of the local burlesque scene here in greater New Orleans, and we're growing. I am very thankful to The New Orleans Burlesque Fest last year not only for its art and presentation of burlesque, but also for its professional warmth. The experience was life-altering and has propelled me into a whole new career in photojournalism as the publisher of BurlesqueScene.com." Photo of Michelle L'amour (above) by Jeff Teachworth. Thanks Andy and Jeff! You will find them back at the 2nd Annual New Orleans Burlesque Festival from September 17-19. We can't wait to see the new photos!